Fairvel velvet makes stunning gift wrap. Gingham is a charming way to present your presents; the use of eyelet fabric for ribbon completes the look. Sheer tulle fabrics and ribbons can also used as ribbon. Are you seeking a stunning, yet practical way to wrap your gifts? Wrapping your presents in fabric can make an unforgettable presentation. Fabric gift wrap is a clever extra gift for the sewer, quilter, or crafter in your life. 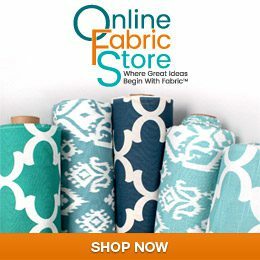 Virtually any fabric can be used as gift wrap. Try elegant velvet or velveteen for a rich look or cheerful prints, such as Amy Butler or Joel Dewberry, for a merry look. If you skillfully tuck your fabric under you can secure it with ribbon; no need for tape. Wrap the ribbon both vertically and horizontally around the box and tie it in a big bow. Poly mesh ribbon is excellent. For rustic look, wrap packages in burlap, craft burlap, or feed sack bags. Wrap with jute ribbon to complete the rustic effect. Amy Butler fabrics can be used as charming gift wrap throughout the year. Notice the clever use of two fabric for the ribbon.